We had to decamp for three days. Really one solid day, plus two half days. Practically the entire time we were gone, it rained. In fact when the rain left us here in South Florida, it paid a visit to Havana Cuba where I hear it caused a lot of damage. Wet Cubans aside, we ended up at Ed Lugo's Resort. Just around the corner and up the block from the house, this place was perfect for us. A small two bedroom house with one bath. The place gave me ideas about redoing the bathroom here. Remove the tub, add a glass partition wall and make the whole thing a shower. I can hear my mother complain that "You'll never sell the place, families want tubs!". Sorry, Mom, times changed. Plus I'm 6'4" and need the room. Fantasy discussion with Mom aside, the place was fine. Ed has done a nice job of clearing the backyards out and connecting them all together with a pool, large hammock, and places for discussion with other guests and the friendly staff. In Ed's accommodations, we were comfortable, excluding the dog. Rack had never been away from the house for any length of time since he joined us in April. It was November when we left our house. He was recovering from his experiences as being a shelter and a rescue, and really still has a way to go. Any loud noises at home will send him running for the crate. Tuesday and Fridays are trash days here on my quirky little island, and he will spend most of the day hiding in his big plastic box. If the windows are open he's up and down all day. Anything noisy gets him running off. My neighbor Kirby taking D.O.G. (yes, that is his name) for a walk, and Rack comes back into the living room trying to see. Rack loves Kirby. I think he likes D.O.G. as well, but Kirby is the attraction. So we're breaking him of his fear of loud noises to tell him that everything loud is Kirby on his big motorcycle. It is starting to work, but has a way to go. Yes, I am lying to my dog. No, don't judge. So taking our little boy out of the comfort of my little house to the small place we stayed at at Ed Lugo's was a big disruption. His usual fear was compounded by the confusion of not being at home. I have had him longer than anyone else at this point, but I had to wonder if inside his little mind he was thinking that he might have been one step away from another stint at another rescue. No, get that out of your mind. He did start to get used to it by mid day the second day, but we simply didn't concern ourselves with that. Putting the crate in the door to the front bedroom helped, he could lay in his safe room and watch us while worrying about all the drama around him. On the other hand, getting him out of the house was easy. We got to take him out to different areas in town, he got to visit the Island City Park Preserve, and sniff new trees and fences. Being a McNab Dog means he is extremely intelligent, and he did learn the area and which little house was our little house within the first 24 hours. On the other hand, getting him out to the quieter areas meant you had to get through the noise first. It really only was about 48 hours for us. We had him out back to visit the house Chihuahua which helped him a lot, but every little noise sent him to the door of the house for refuge. When you have a fearful dog, or cat, or person, life means making adjustments. We did finally adjust him to the situation, in fact a bit quicker than we thought, but it did take time. Better to get back to the normal routine at 9am that Wednesday. That day, we took all the crap we brought with us, loaded it back in to the vehicles, and made the short hop back home. What took us 4 car trips to load only took us two to get back. When Rack saw his crate get into the back of the car, he got hopeful and nervous at the same time. Well really, he gets nervous with a summer breeze blowing through the house. The crate leaving meant he began to almost panic. However, opening the door with his leash on meant every time he passed by the tailgate of the car, he would hopefully look at it to leave. 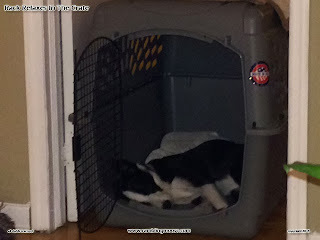 Finally when the time happened, in the rain, he vaulted into the crate and we left.